Since several years the city of Paris makes great efforts to improve the air quality of the city. The reduction of private car traffic, extension of the road-net for bikes and buses, stimulation of greening of façades, balconies and window sills , the foot of street trees with plants and community gardens on inner city free of deserted spots : these are central fields of action. BIOTOPE CITY has published about this several times. Two of these elements of this strategy which the local government is using are combined in a special project in the 12th district: the project of a community garden on the top of a school. This project realizes three aims at the same time: a urban climate one, a social, community action one and an educative one. It is worth while to follow this experiment – so fare, with the experience of three years, a very successful one. 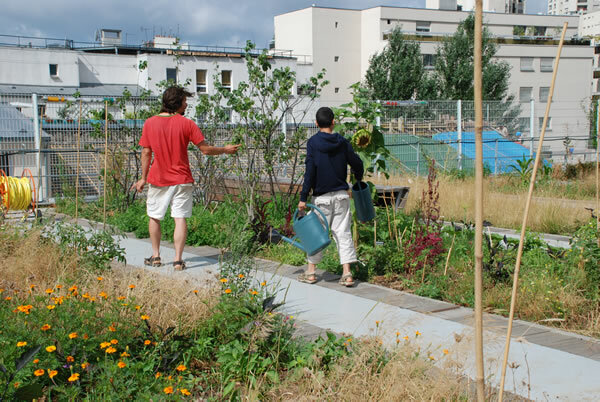 The community roofgarden is 800 m2. It is a public-private activity. Contributors were: The central government of Paris, the local government of the 12th district, the school, Paris Habitat, the architects of the school, entrepreneurs and the Association LaFayette Acceuil (a social organization for woman, one-parent-families, re-integration, handicapped peoples and other disabled persons etc.). The garden is used as an outdoor recreation in this densely built area and at the same time as an outdoor classroom for the scholars on biology etc. The access is open for everybody. There is a open staircase along the façade but also a lift.